Defendants Claim They are Just "Volunteers"
In an unbelievable assertion, the nine Board Members of the National Board of Chiropractic Examiners (NBCE) being sued by ousted Board Member Margaret Colucci, expect people to believe that they are "volunteers" for the NBCE despite the hundreds of thousands of dollars paid to them every year. For example, Norman Ouzts was paid $31,400.00 in 2016 as just a member of the Board of Directors for one hour of work per week. This comes out to $603.00 per week. Ouzts total NBCE compensation from 2008-2016 was just over $225,000.00 as a member of the Board of Directors. In a lawsuit filed in the District Court of Weld County Colorado the President of the Federation of Chiropractic Licensing Boards (FCLB) Margaret Colucci DC and her attorney accuse the NBCE and nine of its Directors of engaging in a "witch hunt, harassment and scheme" to remove her from the NBCE Board of Directors. The deeply revealing lawsuit of the inner workings of one of the most powerful organizations in the chiropractic profession describes a series of breaches of the NBCE's governing corporate documents and applicable law that led to the removal of Dr. Colucci who was the only female NBCE Board member from May 2016 until the time of her removal from the Board. In their Motion to Dismiss the lawsuit filed on May 1, 2018 the Defendants argue, among other things, that they ". 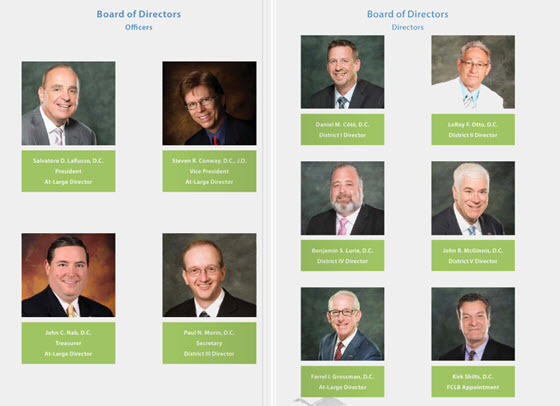 . . are volunteer members of the NBCE's Board of Directors . . ." and that they are ". . . immune from liability pursuant to Colorado Statute which protects volunteers of non-profit organizations." "The NBCE embraces the philosophy of lifelong learning and demonstrates the values of integrity, honesty, fairness, transparency, and accountability in its interactions and relationships"
Norman Ouzts was paid $31,400.00 in 2016 as just a member of the Board of Directors for one hour of work per week. This comes out to $603.00 per week. According to the 2016 NBCE tax records the EVP position Ouzts took over (and which is one of the issues in the Colucci case) had a total annual compensation of $199,794.00. NBCE Board members paid themselves a total of $364,156.00 in 2017 alone for one hour of work per week. The NBCE and its Board of Directors enjoy a monopoly control over the ability of all chiropractic graduates to get a license in the United States.